Are you tired of the same old look and feel in your space? Replace the outdated floors throughout your home with an option that is as stylish as it is practical. Our local showroom features endless options of tile choices for every room in a home. Our sales associates are happy to recommend products for rooms that experience wear and tear on a daily basis. During your visit to our store, you will find a vast selection of popular tile fashions that deliver the style and durability your household needs. Shop with us today to explore our numerous options for ceramic tile in Ann Arbor for any area or room in your home. With so many options you are sure to find the floors that perfectly suit your needs in appearance, performance, and price. You expect and deserve the very best for any room in your home. When you visit our store, you have numerous ways to ensure your floors withstand the wear and tear of an active lifestyle. The natural characteristics of a ceramic tile floor make it a practical material that fits in kitchens, bathrooms, and other rooms. Once you have chosen the right material for your home, let us take care of your project for you. Investing in quality floor installation is just as important as choosing a quality floor product. Turn to us for professional installation backed by unparalleled warranties and guarantees. We employ a team of in-house technicians capable of completing even the most expansive of installation jobs in a timely manner. Our experienced professionals have the skills needed to ensure a top quality result for any shaped space. With our swift and sure services, you won’t have to worry about replacing your flooring again for many years down the line. We focus on the details to deliver a flawless outcome for your services. Receive the service that you expect when you turn to the team at our showroom. You can depend on our in-store associates to guide you through the entire replacement process. From selection to installation, we deliver exceptional service every step of the way. This guarantees you are more than satisfied with any tile product from our showroom. 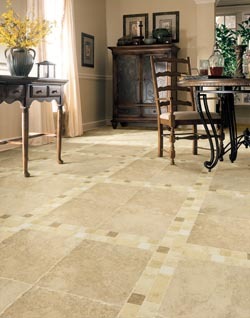 Stop in today to discover how adding a tile floor can create a focal point in any part of your home. With all of the options available on the market, it can be a bit difficult to find the right one for your space. No matter what your personal taste preferences are, there is a product out there to fit your needs. At our showroom, we believe that finding the perfect tile for a single room or your entire home doesn’t have to be a challenge. We make it easy and even enjoyable to shop for all of the stunning materials you desire. Contact us to choose the right colors and patterns for your ceramic tile. We proudly offer a full selection of ceramic tile floor products to customers throughout Ypsilanti, Plymouth, Brighton, Jackson, and Ann Arbor, Michigan.